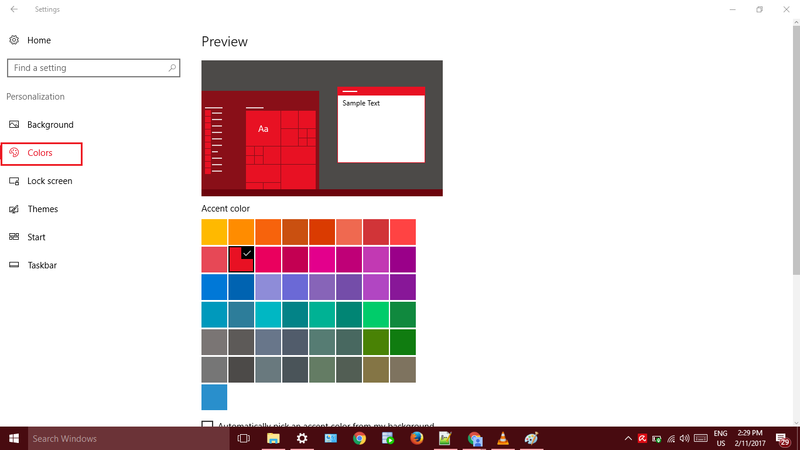 When Windows 8 came out, it came with a new UI design language called Metro UI. Although it is important to note that, Metro UI has been the design mantra for the Windows Mobile devices since a very long time. 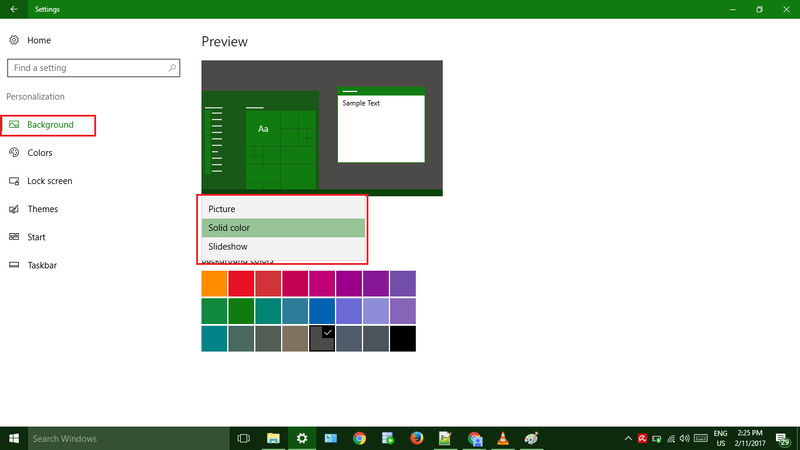 One of the great advantages of bringing Metro UI to desktop is that, we can do some amount of customization to you Windows Desktop devices. Even though Windows has always allowed some amount of customization (like changing the system color an all), Metro UI takes it a step further and also present a fresh new look for the people who always want to try something new. It is also important to note that a great many number of people doesn’t quite like the Metro UI. Personally, for me, I don’t hate it but that not necessarily means that I love it either. It’s just there. It works. 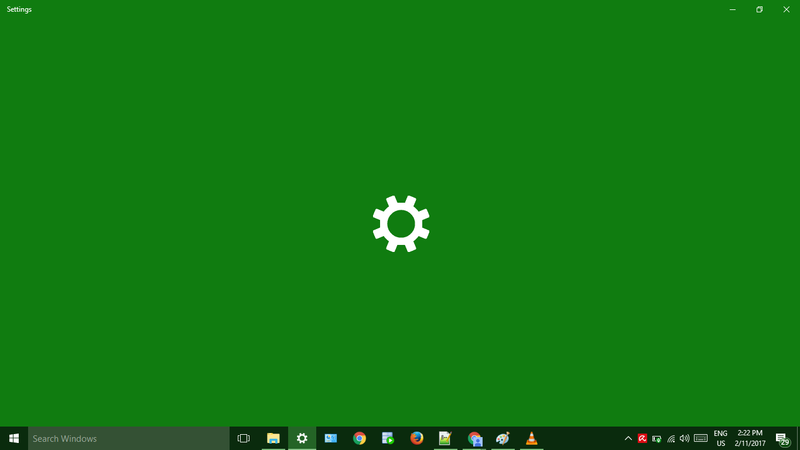 Now let us take a look at the customization that Windows 10 provides through the metro UI. Note that, even though this article is primarily written for Windows 10, it can also be used for Windows 8 desktop devices as well, as the options are almost identical with very minor changes. To start customizing your Windows 10 device, head on to the setting app. Can’t find it? 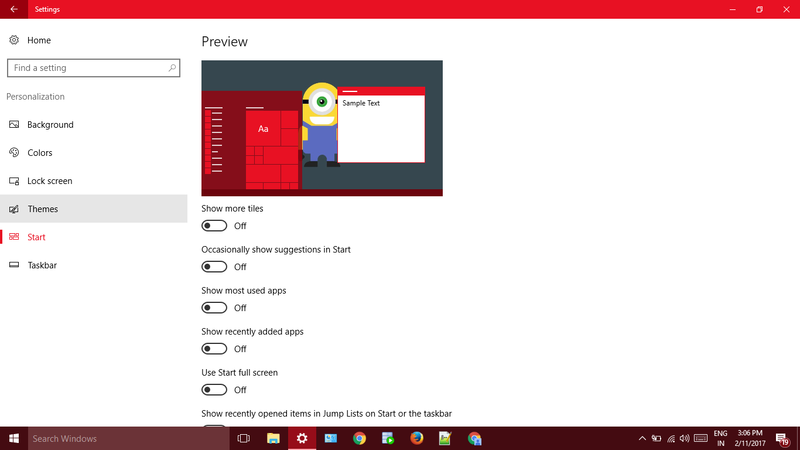 Simply search using the ‘Search Windows’ search box in the task bar. You will find it there. One you are inside the setting app, click on the Personalization option. 👉 Solid Color – Choose a solid background color from the set of available color options. It will be applied as you desktop wallpaper. 👉Slideshow – If this option is chosen, you will asked to choose a folder containing pictures of your choice. The default folder will be ‘My Pictures’ system folder. 👉 Picture – Lets you choose a single image which will be set as your homescreen wallpaper. The next option is ‘Color’ which, as the name indicates, lets you choose color which will be applied as the overall system theme. The next option is ‘Lock Screen’. For the lock screen wallpaper, you have three choices. 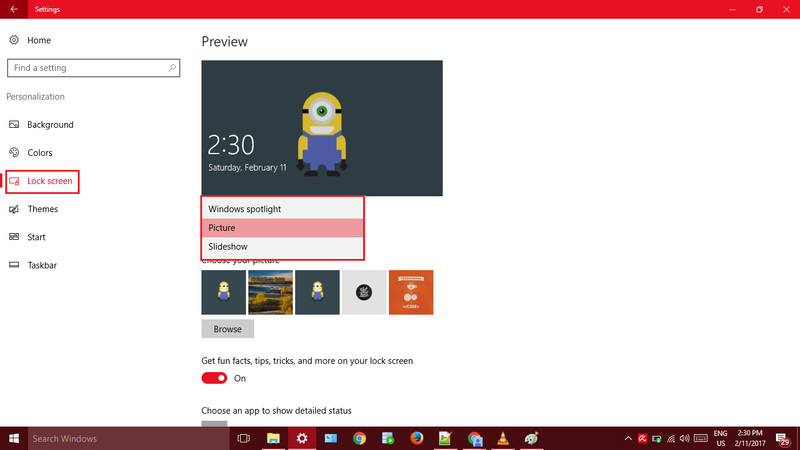 👉 Windows spotlight – If this option is chosen, windows will automatically diaplay colorful wallpapers which it downloads from the internet. You will be greeted with a different wallpaper from time to time. 👉 Picture – As the name says, lets you choose a single image as lock screen wallpaper. 👉 Slideshow – Similar to what we have seen in the previous section. Lets you choose a folder of your choice and displays the images (image changes on certain interval) from it as lock screen wallpaper. The next section is ‘Start’. This section gives you the options to customize your start screen. All the options in this sections are pretty simple and self explanatory. Explore and have fun! The final option is ‘Taskbar’. 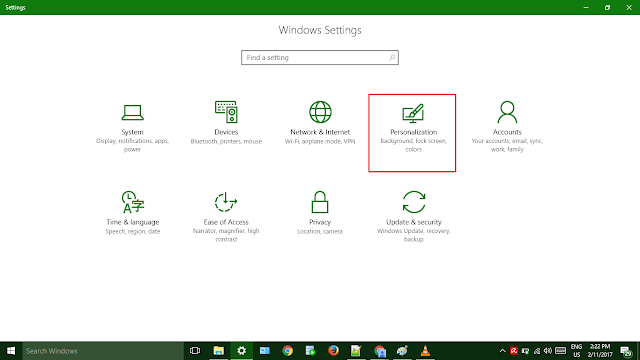 Presents you with options to customize your taskbar. 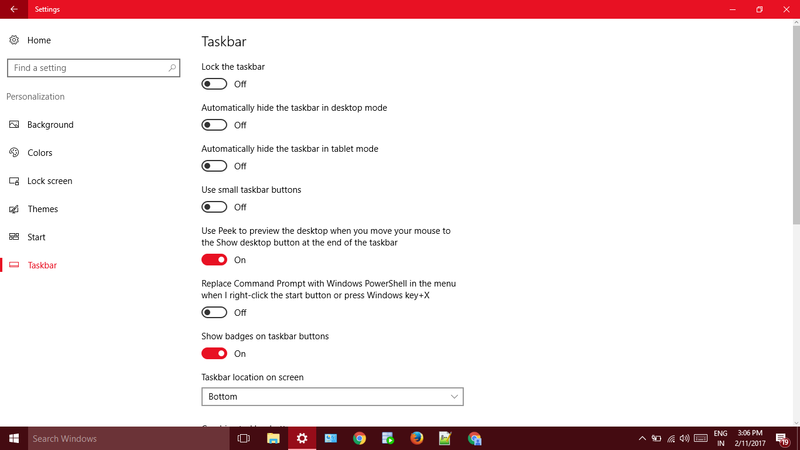 Very, very similar to the taskbar setting available in the previous Windows versions. Gives you the option to lock the taskbar, hide the taskbar automatically, choose where to display the taskbar, say, top or bottom or left or right, etc. If you need any help with the contents in the article, please feel free to leave a comment below or shoot me an email at themefoxx@gmail.com.